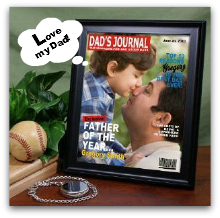 What is the key in finding the Perfect Birthday Gift for Dad? Simple - the gift has to be unique. . . just like your Dad. I've chosen gifts which I felt were very unusual and excellent choices for Dad. Some of these presents are personalized. Some are for Dads who . . .
All the gifts I'm going to share are a little different. . . enjoy! What can be a more perfect gift than a magazine cover with the two of you! This is so unusual! I know if I would have been able to give this to my Dad, he would have really loved it. This is definitely a gift that your Dad has never received before and will cherish! If your Dad likes to wear jewelry, and it's a special birthday . . . he might really like one of these rings! I've found rings in silver, yellow gold, white gold, and tungsten. Dad's love pictures of his kids and his family. Putting a treasured picture in a special frame makes it even more cherished. He can put this on his desk at home or at work. He'll have a smile whenever he looks at your gift. With technology now, it's very easy to make great books featuring you and your dad. Learning how to make personalized picture books is really fun and a great birthday gift for dad. There are several different formats to use. Once you learn how to make these books - you'll never run out of gift ideas for friends and family! 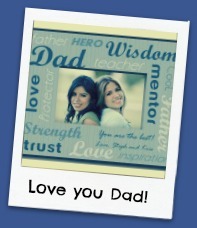 You could also create a personalized canvas gift, or if he likes technology make iPhone or, iiPad gift. What Dad wouldn't love to have a unique plaque to hang on his wall? I've selected several different signs so you will be able to find the perfect birthday gift for Dad. Does your Dad like to fish? Mine did! Some of my favorite memories with my him were when we went fishing together. Does your Dad like to entertain? Is he the life of the party? Then he will really love this.